This is not a film of action, of blockbuster set pieces resplendent in explosions or combat. Nor is it a sweeping romance with flights of whimsy and a lovey-dovey happy ending. No, this is a solid drama, an almost no-frills affair, that takes the time to sit with the characters as they go about the ups and [mostly] downs of their lives. Dramatic films are rarely the most popular, yet they offer tremendous potential in terms of script and performances, as well as cinematography and score. Whilst this film cannot necessarily be described as an enjoyable watch, it is at least admirable in terms of all those factors. DiCaprio and Winslet, reuniting for the first time since Titanic, both give some of their best performances here, and the fact that neither of them was nominated for an academy award for their work would be criminal were it not for an exceedingly strong acting crop that year. 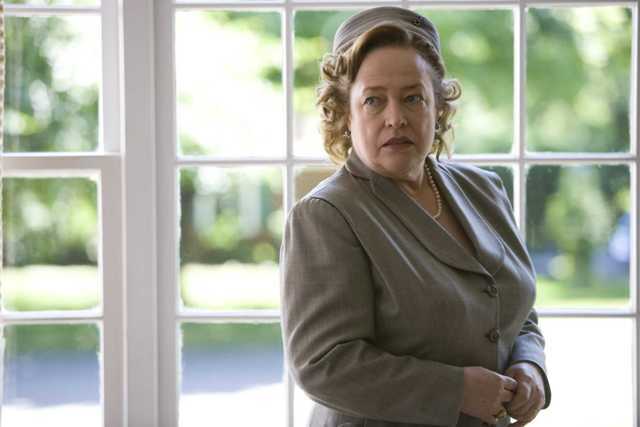 As it stands, Winslet was not only nominated but won the acting Oscar for The Reader in the same year, but personally I think Revolutionary Road saw her give a much more layered display, that was probably only neglected due to it being a more subtle, less showy performance. She perfectly embodies heartbreak, despair, disappointment and joy, all while looking absolutely stunning in the process – and without even getting her kit off. DiCaprio, too, is a joy to behold, barely sheathing his simmering rage at the direction his rudderless life has taken, whilst elsewhere oozing a smooth cool at the office or amongst friends. Even more than the leads, for me this film is about the supporting actors. Dylan Baker is always a welcome presence, and here he is criminally underused as Frank’s colourful colleague, all bowtie, teeth and denial of responsibilities. David Harbour and Kathryn Hahn and also good as the Wheeler’s friends and neighbours, and Kathy Bates makes the most of a small role as their real estate agent. 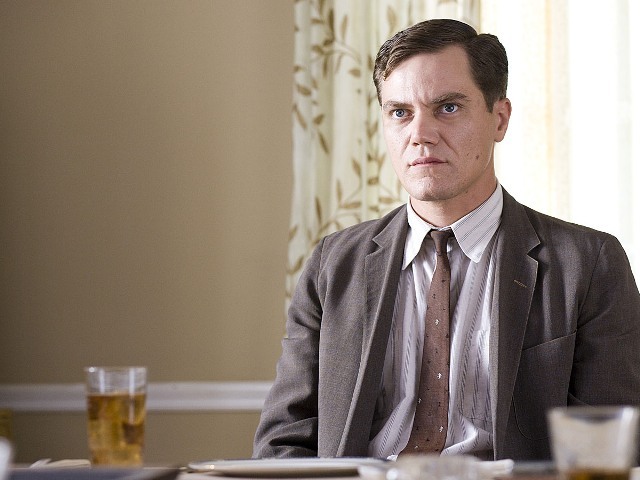 Where the casting really succeeds, however, is with Michael Shannon as John, Bates’ son, a genius mathematician recently released from psychiatric care for attempting to kill his mother with a chair. Yes, I know, I love this guy, but justifiably so, and he is easily the best part of this film, despite being in only two or three scenes, and in fact he was rewarded with his first (presumably of many, I’m sure) Oscar nomination for supporting actor. John’s mother has decided that he needs to meet new people, to reintegrate into society, so she invites herself, her husband and her son round to dinner with Frank and April, and John’s presence is more than felt. He is rude, outspoken and thoroughly inappropriate, which as long as you’re not sat at the table leads to some highly entertaining outbursts and confrontations. I’d cry out for more scenes with him, but I fear he’d have overbalanced the film, and in this case a little goes a long way. Not only is the acting superb, but the film looks beautiful too. Director Sam Mendes collaborated again with his regular director of photography Roger Deakins (Jarhead, Skyfall) to paint an idealistic vision of suburbia that seems to be forever bathed in a light golden glow, thereby making the cracks that appear ever more prominent. The repeated use of the same track on the score for once wasn’t annoying, possibly due to the delightful tune in question, but also because it fit the film so well. The 50s setting is at times distracting, especially when a character drinks and smokes whilst pregnant, and the copious amount alcohol consumed during lunchbreaks, but now I’ve watched more Mad Men (which preceded the film by one year) I’ve become more indoctrinated into that way of life and thinking. I really wish people still said “swell,” without referring to a growth on their leg. In a recent discussion on the Lambcast it came up that not many people liked this film – or at least, they didn’t wish to see it again – and whilst I can understand that – it’s not exactly a feel-good picture – I personally believe there is a lot to appreciate here, especially in terms of several acting masterclasses. This entry was posted in 08/10, Choose Film, Film-Makers, Kate Winslet, Review and tagged David Harbour, Dylan Baker, Jay O. Sanders, Kate Winslet, Kathryn Hahn, Kathy Bates, Kristen Connolly, Leonardo Di Caprio, Michael Shannon, Revolutionary Road, Sam Mendes, Ty Simpkins, Zoe Kazan by jaycluitt. Bookmark the permalink. Wonderful review, Jay. It’s a very underrated, or more so under looked film in both of the stars’ filmographies. I agree with you as well that I thought Winslet was much better in this than she was in The Reader (which really underwhelmed me to begin with). Love the mention of Shannon too, because not a lot of people know he’s in this but his nomination was most certainly deserving. Thanks Nick, and thanks for stopping by. I’d forgotten Shannon was in it from my first viewing (I was only half-watching first time around), but when his name flashed up on the credits I was just waiting for him to show up.